The long answer is much more fulfilling! I made a commitment to myself and our cow herd in 2009 that they would no longer be fed grain ever. Not as a “appetite enhancer” in their mineral, or as a mature plant rolled into a bale. I didn’t know for certain how my cows would respond, but they have flourished! The cattle have rose to the challenge, and have surpassed every hesitation I have had the past. It is my constant desire to do even better, every year. The American Grassfed Association (AGA) uses a 3rd party certification process that verifies that our animals meet or exceed the standards set in the definition of 100% Grassfed Beef. While the USDA does not have an official label for American Grassfed Beef, nor do they govern it in any way. Producers have a little more influence in creating their own standards and adhering, which has benefits! We follow standards including: Antibiotic and Hormone free status on all meats sold, while never denying treatment to animals that need them. Animals that requires treatment are ear marked, and removed from the herd when healthy and well past any withdrawal time, which is the law. Animals are free to move about pastures year-round. Encouraging cattle to have plenty of space to express themselves as each species while cattle are not penned on a dirt lot for extended periods. We do have sacrifice areas that we can place animals if the need arises. Cattle have access to a variety of terrain so they can have shelter where ever they go. Cattle are fed hay when pasture grazing is unavailable with ample room to allow them to not have too much competition. Cows are kept well above a minimum body condition score, which means we keep them fat and happy! 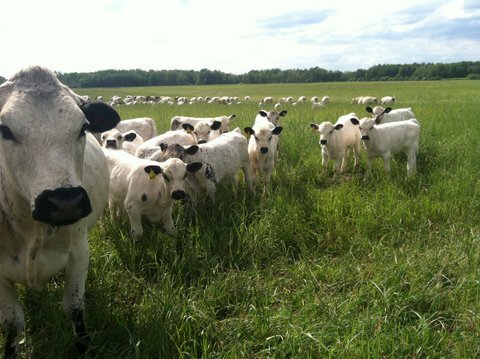 Grassfed beef is somewhat simple to do, but takes some management to do well. Achieving a well marbled grassfed steak with ample back fat is a bit of an art. It’s part genetics, part “epi-genetics” and part management. I am quite savvy when it comes to the 3 together. I only have ONE breed of cattle. This is an advantage with consistency of flavor. I raise all of my own beefs. The herd produces the calves that we raise to finish as steers for beef. We sell any calves that will not make the best beef so they can be finished commercially. One of the big advantages to our beef for the consumer is that it is ever evolving. Because I own the breeding stock, I can look back at the steer’s parentage and see if it was a good paring or not. We get to enjoy the fruits of our labor. You can enjoy it too!